We love reading God’s promise that he has a plan for us – plans to prosper us, to give us hope and a future. Awesome! 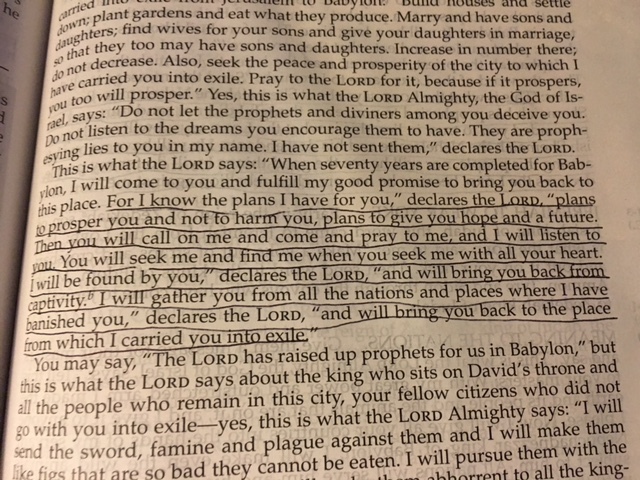 We’re feeling great as we read this in Jeremiah 29. But, if we stop there, we stop too soon. Because God goes on in the next verses to tell us HOW he is going to do this. He goes on to tell us our part of this plan. He tells us that, when we call on him, when we come and pray to him, he will listen. When we seek him with all of our hearts, we will find him and he will fulfill his plans to prosper us. He will give us hope. He will give us a future. God has a part in this plan and we have a part. Too often we focus on God’s part and fail to do our part. Or we can just become lukewarm about doing our part……and then wonder why we have such a unfulfilling relationship with God. Let’s ask ourselves a tough question today – are we faithfully doing our part of God’s plan? What would our lives look like if we were seeking God with all of our hearts? Yes Father in Heaven, open our eyes and our ears and our hearts. Cut away the wickedness from our very own hearts that deceives even us!